San Marzano Tomatoes for sale. Buy online at Zingerman's Mail Order. Gourmet Gifts. Food Gifts. There's nothing shameful about using canned tomatoes. In fact, for ten or eleven months of the year they're usually much better than fresh. San Marzano tomatoes are an heirloom variety that came to fame in Southern Italy in the eponymously named town near Naples. Nowadays they are generally regarded as one of the most flavorful plum tomatoes in the world. I use these at home regularly. They're one of those foods that I always make sure I have some of in the pantry, like good tuna or couscous. 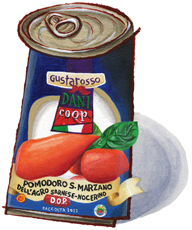 "The real San Marzano plum tomato, meaty and simply the richest-flavored tomato in the world."